Fumitory is an annual, slender, climbing plant; the sub-erect, hollow stem is angular, smooth, and bluish or smoky-green colored. The leaves are frail, alternate, gray-green, and bipinnate or tripinnate with small, narrow divisions. The small flowers vary from reddish-purple to yellowish-white, and have a reddish-black spot at the tip, grow in loose racemes from May to September. Grows practically everywhere on earth, mostly around areas where other plants are cultivated. Fumitory is native to Europe. According to the Webster’s Dictionary the classification of fumitory is of the fumitory family. But some references claim it belongs to the poppy family or Papaveraceae. Fumitory was mentioned by Pliny, the Roman writer (AD 23-79) and by Dioscorides, a Greek physician (first century AD). One of fumitory’s common German names once was scabweed. 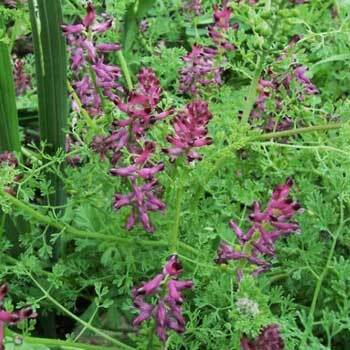 Fumitory is primarily used internally for liver and gallbladder problems, scabies, jaundice, and other skin problems, dermatitis, stomach disorders, cures nausea, vomiting, and exanthema. Larger doses act as a laxative and diuretic, but excessive doses can cause diarrhea and stomachache. For chronic constipation, use fumitory in combination with other appropriate herbs. Taken as a blood purifier. As Culpeper states it: it clarifies “the blood from saltish, choleric, and adust humours; which cause leprosy, scabs, tetters, and itches; and such like breakings-out of the skin, and after the purgings doth strengthen all the inward parts”. He also thought it protected against the plague and pestilence. Culpeper states, “The juice of the fumitory and docks mingled therewith, cures all sorts of scabs, pimples, blotches, wheals, and pushes which arise on the face or hands, or any other parts of the body”. Infusion: steep 1 heaping tsp. herb in 1 cup water. Take cold, a wineglassful at a time, every 4 hours. Cold extract: use 1 tsp. herb with 1/2 cup cold water. Let stand for 8-10 hours. Take 1/2 to 1 cup per day.